snowshoeing, originally uploaded by jahansell. Last night, my amazing daughter and husband went skiing in what seemed like the dead of night - it was 6 when they left and nearly 10 when they got home, glowing and delighted. It was the first outing of the season - at last, after illness, rain, scheduling problems and every other obstacle had kept them away from the slopes. My husband had bought his first ever pair of skis, and said they rode like a dream, but he still couldn't keep up with my nearly-10-year-old daughter, who, on her rented pair, just flies down the mountain. 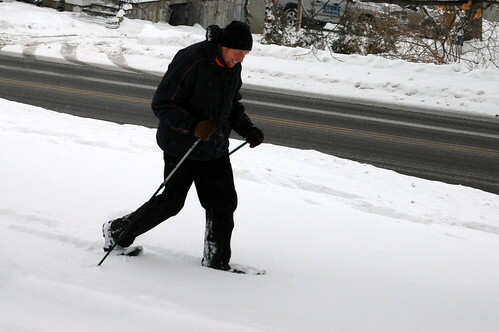 My neighbor, Paul, has another winter sport - snowshoeing, which he was doing as I happened to be walking by. Kate M. sent me a perfect poem to go with yesterday's picture (and the whole year, I think!) - Thanks, Kate! Great shot, it makes me feel tired looking at him, but what fun too. Love the poem.